Edition: Limited Edition Giclees on Canvas to 295 w/ Hand Embellished proofs. Select option from Above. About the Artist: Giuseppe "Pino" Dangelico (1939-2010) was born in Bari, Italy. Trained at The Art Institute of Bari and later at Milan's Academy of Brea, he perfected his skills painting nudes and figures and was heavily influenced by the Pre-Raphaelites and Macchiaioli. 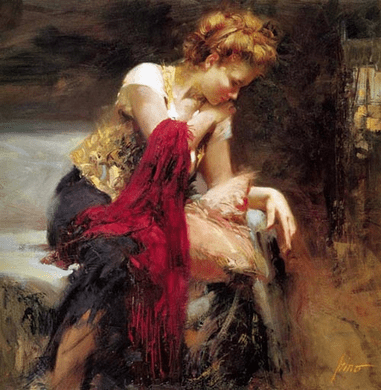 After establishing himself as a successful artist in his native land, Pino decided to immigrate to the United States in search of further artistic freedom and opportunity. He was soon discovered by the distinguished Borghi Gallery, which held several prestigious exhibitions of his work in New York and Boston. Pino's early paintings, featuring soft and romantic characters, caught the attention of major book publishers Dell and Zebra Books. In 1980 Zebra commissioned him to do his first book cover. His popularity soon grew within the literary community, and he became the artist-in-demand for Zebra, Bantam, Simon and Schuster, Harlequin, Penguin USA and Dell. Over the ensuing decades Pino illustrated the covers of over 3,000 books, with his unique style dominating the market. While working as the industry's top illustrator, on the side Pino painted fine art oils; this body of work has become his trademark. Pino's unmistakable canvases elicit feelings of warmth, nostalgia, love and family. The delicately conveyed moments in time are the vision of his alter ego, a young boy surrounded by beautiful women - with his sisters, aunts and cousins serving as inspiration. His paintings are often set on picturesque beaches on the Mediterranean where he grew up. Pino's exceptional ability to capture the movements, expressions and deep contemplation of his subjects has brought his artwork a worldwide following and many commissions for private portraits. His rich and vibrant work closely mirrored his personality. Pino's technique - founded by warm and exciting colors and a subtle approach to his subjects - is his hallmark and demonstrates why his original oils, limited edition giclées and serigraphs are sought after by collectors throughout the art world. Your Authorized Gallery: Gallery Direct Art is an authorized gallery for Pino Fine Art for over 20 years. We offer Free Canvas Stretching and Shipping. Call us with any questions or to discuss Canvas Framing options at 800-733-1144.